Feeling somewhat at a loss for a blogging topic today, I uploaded photos from my iPhone that document recent random happenings. Happenings might be stretching it. We have two new restaurants in our neck of the woods, one of which we will never step a toe in and the other is Tex-Mex (because in a perfect world there should be one on every corner). 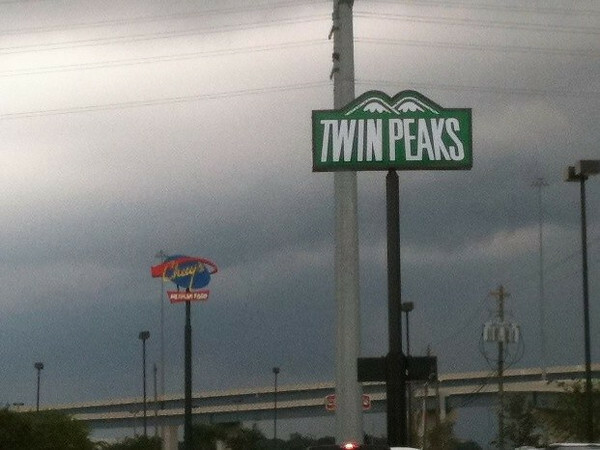 Once I saw the sign for Twin Peaks go up, what with the humpity humps double entendre, I had a sneaky suspicion this restaurant competes with Hooters for its clientele. It's apparently true, but we'll never find out first hand. I'm okay with that. 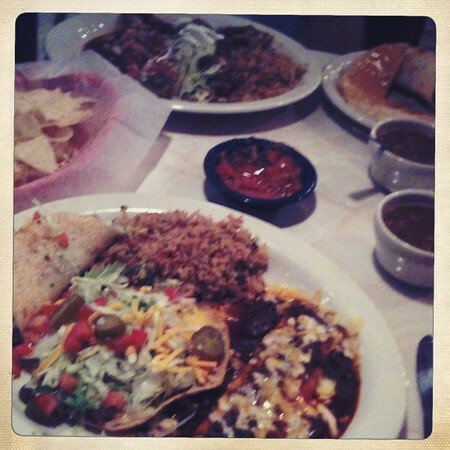 However, we will enjoy having Chuy's less than three miles from our house. The secret right now is trying to find a slightly off time to go since it's new and everyone and their grandma is waiting in line for a table. Scott and I (Annelise was with Pappo & Grandma) went Sunday after church for lunch without too much of a wait (10-15 minutes). Score! I like the 50s kitschy decor, casual atmosphere, and of course the food isn't too shabby either. 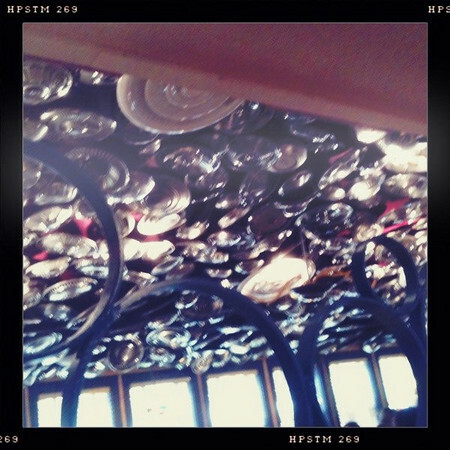 The hubcap adorned ceiling in one room of Chuy's was cool. 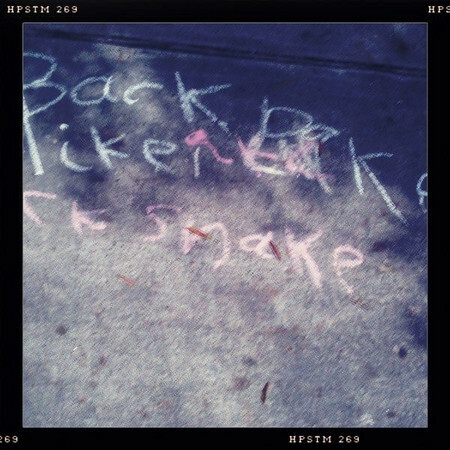 Annelise has been practicing her spelling words with sidewalk chalk and Scrabble tiles. This week has been a wee bit harder for her trying to keep the "ck" and "ke" usage straight. My tried and true, absolute favorite pair of silver earrings broke yesterday (the post snapped off). I was crushed, I tell you, crushed. Silpada, I thought you were made better than that. Maybe I can get you fixed? Sadie and I took a little road trip yesterday to Pasa-get-down-dena, known for Mikey Gilley's dance hall and mechanical bull seen in Urban Cowboy circa 1982-ish. 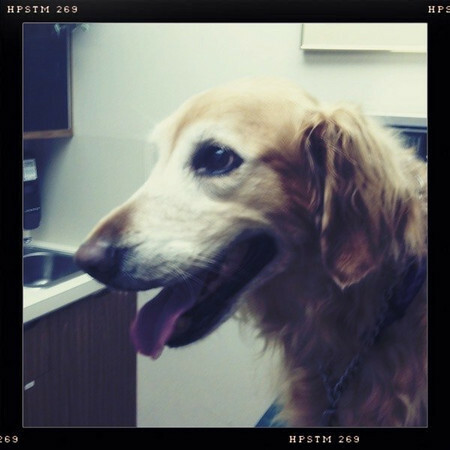 Sadie had to see the vet about a lump on her back (we were getting a second opinion I guess). 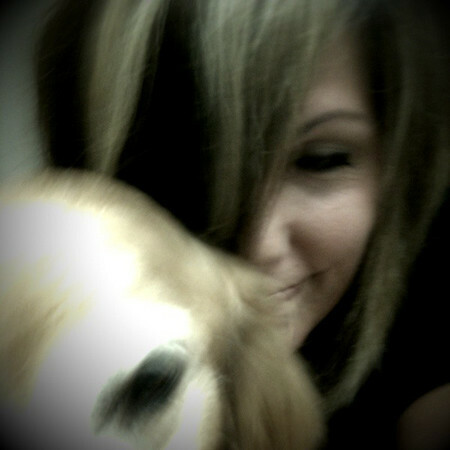 I tried to get a self-portrait with her and she was not cooperating. Plus I was worried the vet was going to come back in and wonder what in the world I was doing. 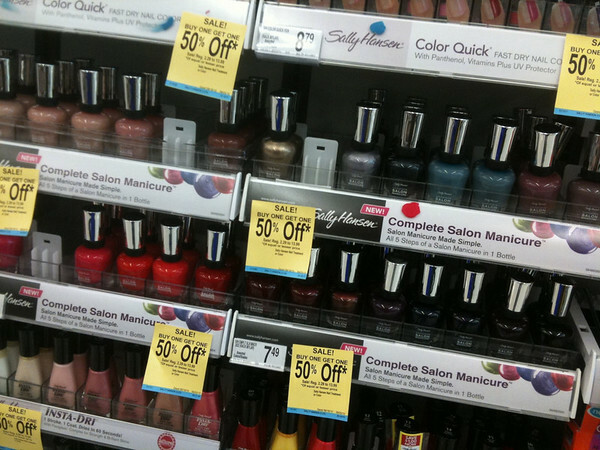 After hearing raves about Sally Hansen's complete manicure in a bottle I popped into Walgreens to check it out. I took a bold step and broke away from my normal sheer pinks and nudes and tried something new. Or two new somethings, since one was 50% off. I chose a blue-black shade called "Midnight in NY" to kind of match my goth toes and a grey/taupe/putty shade called "Commander in Chic". And I'm liking Mockingjay so far too. It was hard to start reading it since I know it's the last in a trilogy and I fear I will suffer literary let down when I finish. 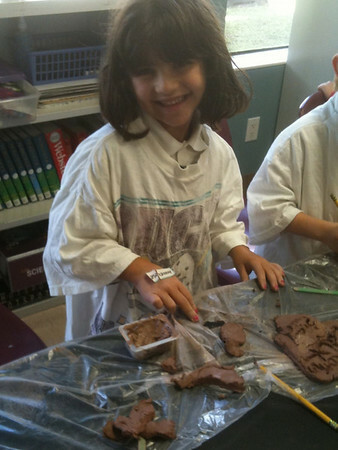 Annelise had her first art after school class today and loved every minute of it. The theme is Dutch Masters, so I guess they'll be learning a little bit about them each class and then using different art mediums. Today was clay. I asked her about her class and she explained how a master was not only a ruler over a servant but someone who was really good at something, so that's who the Dutch masters were. She couldn't remember the artist's name but she mentioned seeing a lady with a smile and I said, "You mean the Mona Lisa?" and she yelled, "That's it!" Except DaVinci wasn't Dutch, so I'm not really sure how the lesson went. As we were leaving she had to show me her new favorite thing ever, the skip ball. Which was rather heartwarming because it brought back my memories of the Lemon Twist, which truly was the best toy ever. Even when you whacked your ankle with the hard plastic lemon and swallowed your tears so you could keep on twisting. I get misty just thinking about it. And then my ankle throbs a little. Did you have a Lemon Twist? Have you tried Sally Hansen's polish? The Lemon Twist was right up there with the Sit-n-spin and the Hippity Horse, for me!! 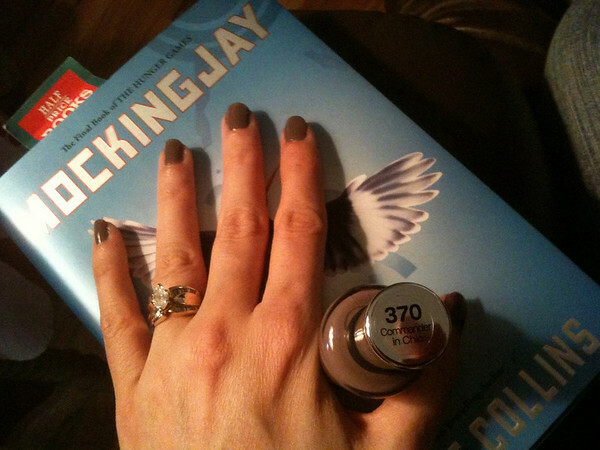 I am a big fan of Sally's nail polish. I've not worn polish for about two weeks now, and I'm wondering what the heck is going on with me? I have commander in chief on my tootsies right now and have it on the coffee table to put on my digits this weekend......out of all the polish colors/brands/etc we have one that is the same.....did you wear Revlon's "Cherries in the Snow" as a teen? It was my fav until OPI came out and then my fav was "Texas BBQ" which they discontinued :( Pinks and nudes are my classics too. I was number 2 in line for Mockingjay at my library (out of 500 people) and counted the days until it came out and then couldn't bring myself to read more than a chapter. And now I feel a little guilty for keeping it for 3 weeks and not reading it when other people were waiting. I think I'm just going to go buy all three and then start over. Hopefully I'll be over my fear of the story ending by then. I love Sally's manicure in a bottle - it is so easy to put on. But I've found it chips off faster than I would like it to. I do think the good outweighs the bad, though, and will be sure to buy more. I live for Chuy's creamy jalapeno dressing. 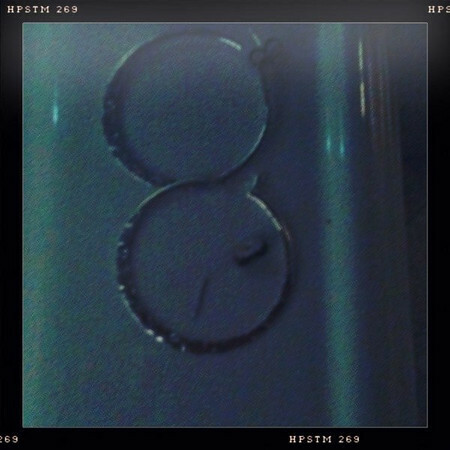 I pour it over everything I eat there. Yum! I didn't have the lemon drop but had something similar. I loved that thing. I love that nailpolish on you. It looks great! I am reading Let the Great World Spin, which takes place in new york when that man walked on a tight rope between the world trade center towers, and tells several interconnected stories. I like it a lot so far. 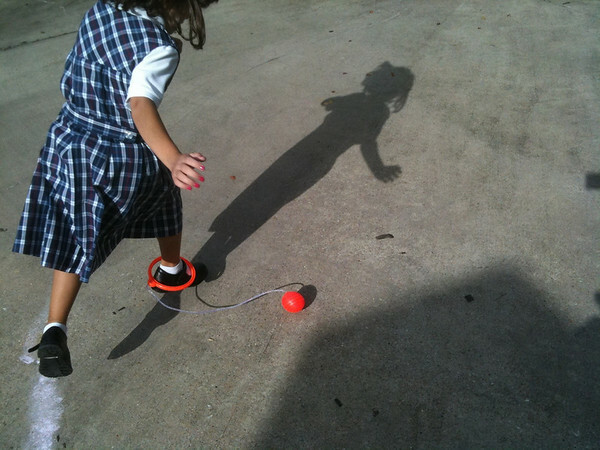 i remember having a "skip it" or something like that only it had a straight piece connecting to the ball. AND it had a counter so you could see how many skips you did in a row! Fancy, huh? 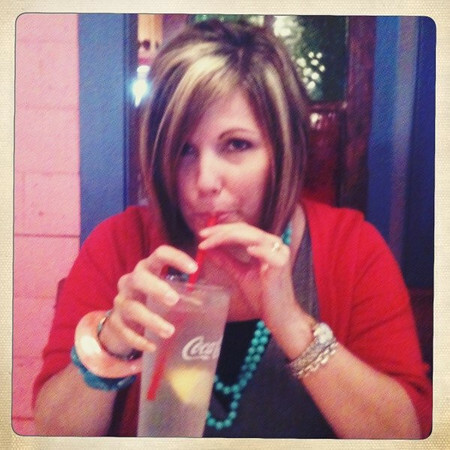 oh and i love chuys! i just realized that now that i've moved, I no longer have one near me! bummer. I just finished reading Storyville (about the red light district in New Orleans at the turn of the century). I can't stand any polish on my fingernails but do like it on my toes . . . usually use OPI though. Griffin is into the spelling words in chalk (and shave cream!) for homework too. I have bought a few shades in the Sally Hansen line, but only ended up liking one. Plum Luck was too dark, almost black. And I bought a pink color that disappointed. I am reading No Less Than Victory by Jeff Shaara, the third book in his WWII trilogy. I haven't been wearing polish lately at all, so this bold color is certainly an adjustment. Maybe I'll get into the habit of painting my nails more regularly now. Lelly: I'm sorry you haven't had time for reading lately. I hope that changes soon. But you've made some COOL wreaths. Amy: I'll have to try their Tres Leches. Sounds dangerously yummy! Amy E.: I hope you give Mockingjay another chance--it's really good. I'm trying not to dwell on the fact that the series is over either. Anne: Ooh...jalapeno dressing? I did not know that existed. Will have to try. Natasha: Storyville sounds interesting/ I'll have to see if our library has it. Maybe we'll try shaving cream for her spelling words next week--fun! Nicole: I read the Jeff Sharra's Rise to Rebellion about the American Revolution that you had recommended once and I really liked it. I'll be sure to look for his WWII series at the library soon. I love that time period. This post was full of goodness. I'm disturbed by the Twin Peaks restaurant and feel embarrassed for everyone involved. 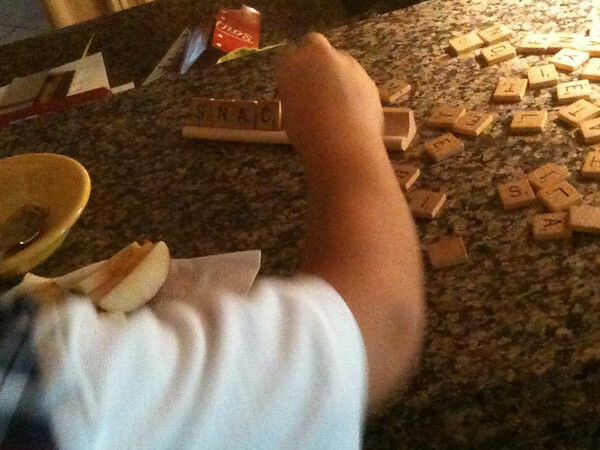 I think the scrabble tiles are a brilliant way for Annelise to practice her spelling words. I had a favorite pair of small silver hoops that broke too and I haven't found any to replace them. 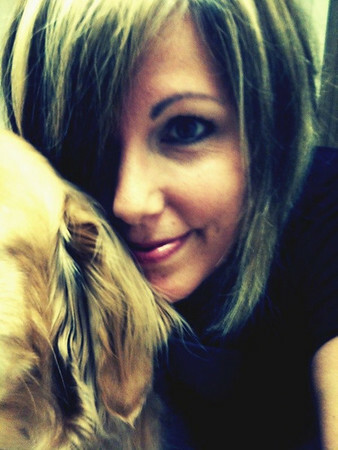 The self-portrait with the dog is funny. I love the thought of you trying to capture it before the Vet came back in the room. I had literary let down after finishing Mockingjay. The Dutch Master Mona Lisa is funny. I love the Lemon Twist!